Carlton Fisk was elected to the National Baseball Hall of Fame and Ted Simmons should be, too. On offense and defense, Simmons’ qualifications are at least equal to, and possibly stronger than, Fisk’s credentials. Knowing the position and what it takes to perform at a Hall of Fame level, Fisk should be an advocate for Simmons. Both catchers had reputations for intelligence and leadership. Though Simmons had 76 fewer career at-bats than Fisk, Simmons topped Fisk in nearly every major hitting category. Simmons had more hits, doubles and RBI than Fisk. He also had a higher career batting average and a better career on-base percentage than the former Red Sox and White Sox catcher. Fisk had more home runs than Simmons. Fisk and Simmons both played positions other than catcher in the major leagues. Counting just their games caught, Fisk had about 1,300 more at-bats than Simmons, so naturally his hitting totals are the highest. But Simmons had the higher batting average and on-base percentage. Fisk and Simmons are similar in the key defensive areas, too. In 24 seasons (1969-1993), Fisk had a .988 fielding percentage as a catcher. In 21 seasons (1968-1988), Simmons had a .987 fielding percentage as a catcher. Simmons and Fisk are nearly identical in percentage of runners caught stealing. Runners stole 1,188 bases with Simmons at catcher and were caught 611 times. Simmons caught runners stealing 33.9 percent of the time. Runners stole 1,302 bases with Fisk at catcher and were caught 663 times. Fisk caught runners stealing 33.7 percent of the time. That’s the only World Series Fisk played. Simmons, too, played in one World Series: 1982 for the Brewers against the Cardinals. Fisk hit two home runs in the 1975 World Series. Simmons hit two home runs in the 1982 World Series. Neither played for a World Series champion. Fisk and Simmons played against one another for five seasons (1981-85) in the American League while Fisk was with the White Sox and Simmons was with the Brewers. In 19 games against the White Sox at Chicago’s Comiskey Park, Simmons batted .360 (27-for-75) with 12 RBI. Overall, Simmons hit .286 (46-for-161) in 42 career games against the White Sox, all while Fisk was with them. Ted Simmons was a pure hitter, and a switch hitter to boot. Unfortunately played for the cards during the 70’s. Finally got to the big show with the brew crew, ironically against his long time team, the cards, Simba, was past his prime by then. In his prime he was a .300 hitter and doubles machine. His somewhat aloof personality and long hair, probably put some old school guys off, like possibly Whitey Herzog, who traded him away. He has the stats for the hall of fame. Much better than many catchers already inducted. Here is a breakdown of the year to year comparison btwn the Hall of Famer Carlton Fisk and the snubbed Ted Simmons. You tell me who had a more consistent better career. Good work, Terry. Thanks for supporting the case for Ted Simmons for the Hall of Fame. You take a look and see Simmons had a better year but the OPS+ has Fisk at 162 and Simmons at 127. How come? Boston has a park factor of 106 and Busch Stadium 99 but we know Boston is a hitters park and St Louis isn’t. Fisk hit .301 at home and .284 on the road. So Simmons only batted 10 points higher but at a pitchers park. Simmons hit .285 at home and .320 on the road. So Fisk gets a boost by hitting in a hitters park and hits .301/.284 and Simmons is .285/.320. When comparing these two year to year for 15 years every year Simmons was at a tougher park to hit. Fisk had 45 xbh and 35 RBI’s at home. Wow not much of a difference for Simba with his 99 park factor compared to Fisk and his 106 home park factor. So why did Simmons have more RBI’s? With Fisk 69 xbh’s and 75 singles he knocked in 61 runs and Simmons knocked in 96 with 58 xbh’s and 122 singles. So pretty similar with no one on but big difference over a career with runners on. 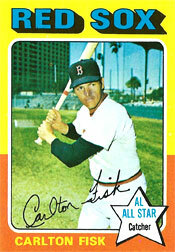 At home at a hitters ball park Fisk hit only 5 points lower than Simmons did in a pitchers park. The road shows how the park factor had an effect on both of their careers. The one in the Hall had the benefit of playing in + hitting parks compared to the one who got 17 votes played in a pitchers park. Baseball is an incredible game that you can really dive into performance and it blows me away that Hall of Fame voters don’t put in the effort. Thanks, Terry. The case for Ted Simmons is strong in so many ways and you really have helped the cause. You are very welcome, do you know who voted for Simba in the veteran’s vote? I heard LaRussa say he wishes they could vote for more than 5 people since Simmons would have been on his list. That is the ultimate compliment from rojo who forever has been one of the most astute observers of life. I feel my live’s journey has been complete! Thank you. Started following the Cardinals in the 70’s, a decade in which they had something, but never enough. Ted Simmons was one of the factors that kept me coming to the ballpark. Definitely a Hall of Famer. Robert: I appreciate your feedback and your support of Ted Simmons for the Hall of Fame.